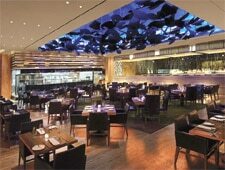 Seafood takes a starring role at Michael Mina's American Fish at Aria. Chef Michael Mina is GAYOT's 2011 Best Restaurateur in the US. 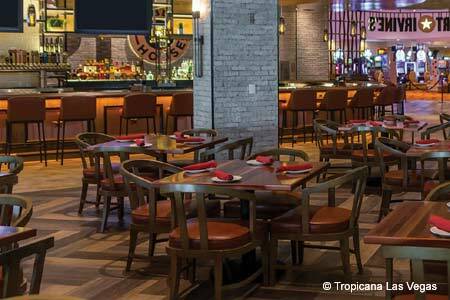 : On the second floor of the colossal Aria hotel, the American Fish restaurant shines as a little gem of refinement and enchantment. The bar planted at the edge of a wood --- at least, seemingly, thanks to rows of artistically synthesized trees --- towers over the rectangular room, which has slices of tree logs as flooring. The green touch: recycled wood was used for the tables. The ceiling is populated with black forms in which diners can identify, depending on their mood and preferences in nature, as birds, fish or just abstract sculptures à la Calder. The exposed kitchen reveals an oven fired by Californian apricot tree wood and sophisticated rotisserie machinery that rises or drops with heat to ensure the required cooking temperature. Alaska king crab comes as an accompaniment steamed or grilled, and the snapper baked in salt crust is matched with orange and chili-glazed fennel and pearl pasta. Surf ‘n’ turf territory brings Maine lobster tail or Hudson Valley foie gras cast iron-griddled. Among the mostly fish-based entrées are the Alaska halibut in a cioppino broth with fennel; bacon-wrapped rainbow trout with white beans; and a mustard-marinated black cod. Carnivores are not totally overlooked: they have a choice of flat-iron, filet mignon or Snake River Farms Wagyu rib-eye. One cannot resist the seductive Valrhona chocolate custard with a red velvet cake and cocoa nib ice cream, nor the mascarpone cheesecake under a vanilla crust. Service is well oiled, while the wine list deserves a special mention, not only because it is huge and offers extraordinary vintages --- at astronomical prices, like a Romanée Conti 1990 --- but mostly because the savvy sommelier Bruno Bonnet has composed the core of his inventory with bottles of little-known vintners in France and elsewhere that are rare finds at affordable prices, like his artisanal Champagne Chartogne-Taillet from Mersy near famous Mesnil sur Ogé.